How long is FORTAG, exactly? What kinds of landscapes will FORTAG go through? When will it be constructed? Is FORTAG a form of transportation? What events will be held on FORTAG? What is considered "open-space" in the "greenway"? How wide does FORTAG need to be? How much will FORTAG cost? Who will pay for FORTAG? What will be FORTAG's economic impact? Has anyone done this kind of thing before? Is the route locked in? Is FORTAG tied to any particular proposed developments? Is FORTAG consistent with the Fort Ord Reuse Plan? Will FORTAG go through private property? What themes does FORTAG facilitate? How will FORTAG impact the environment? How long will FORTAG take to build? Will FORTAG be built in stages? Does FORTAG have to be paved? What approvals are needed to build FORTAG? How will FORTAG be maintained? Does the FORTAG alignment go through the "Impact Area" where the Army is clearing unexploded ordinance? I am a mountain biker. How will FORTAG benefit me? I am an equestrian. How will FORTAG benefit me? I am a road runner. How will FORTAG benefit me? I am a trail runner. How will FORTAG benefit me? I am a hiker. How will FORTAG benefit me? I am a birder. How will FORTAG benefit me? I'm in a wheelchair. How will FORTAG benefit me? I have young kids. How will FORTAG benefit me? I'm a bike commuter. How will FORTAG benefit me? I live in Seaside. How will FORTAG benefit me? I live in Marina. How will FORTAG benefit me? I live in Del Rey Oaks. How will FORTAG benefit me? I live in Monterey. How will FORTAG benefit me? I live in Sand City. How will FORTAG benefit me? I live in Salinas. How will FORTAG benefit me? I live in Carmel. How will FORTAG benefit me? I live in Castroville. How will FORTAG benefit me? I live in the Bay Area. How will FORTAG benefit me? Can I give you a piece of my mind? Can I get a high-resolution copy of the photo? Can you remove the photo from the web site? Is FORTAG a CSUMB project? Does it have to be called FORTAG? There's a few ways to answer this question. The Northern Loop trail is 13.0 miles. The Southern Loop trail is 16.3 miles. The central 'CSUMB' loop is 5.7 miles. If you combine these by connecting directly from 8th & Gigling to Whispering Oaks near CSUMB, you get a single, outer 'grand coastal loop' trail at 26.7 miles, almost all in open space. This includes 7.5 miles of the 'Coastal Rec Trail' that already exist, leaving about 24.3 miles to be constrcuted as part of the 'FORTAG' trunk. This last figure includes a 1.4 mile segment to Ryan Ranch. A number of additional spurs are envisioned to provide connections between local neighborhoods and FORTAG. Ones that we're trying to include as part of the overall FORTAG budget are a 1.0 mile connection along California in Marina, and 0.6 miles of connections in Seaside to Hilby, Broadway, and San Pablo avenues. Everything is subject to change, of course, as plans crystalize. 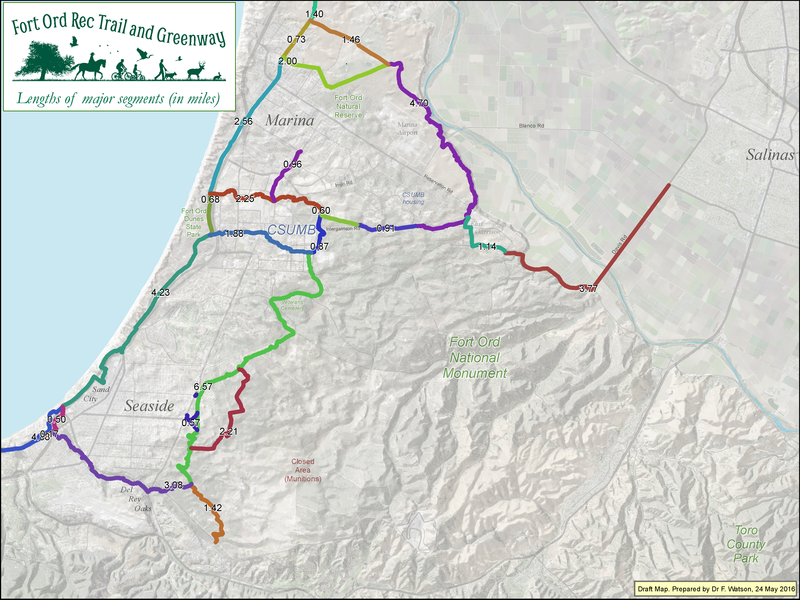 The proposed route of the trail and greenway takes in a wide range of landscapes including: undulating oak woodland, wide open grassland, chaparral ridges, bluffs overlooking the Salinas Valley, secluded riparian forest, city parks, playing fields, and promenades through residentialand commercial neighborhoods. Its for three kinds of people. Firstly, its for those of us who already live here, especially folks in Marina, Seaside, Del Rey Oaks, Monterey, Sand City, and Salinas. Secondly, its for visitors to our region; it promotes the idea that Marina and Seaside are ideal anchors for a recreational trip to the southern Monterey Bay area. Finally, and most importantly in terms of economic benefit, its for the people who should want to live here; people who would factor "access to trails close to work or home" into a decision to move to our region. Loops are a really important component of trail systems. The main layout of FORTAG involves two large loops. But many smaller ones will also be possible. These are the kinds of things you'd want to do after work or school on weekdays. You could head out from Marina on a "spoke" trail to get to the main FORAG trail, head along FORTAG for a while, then head back into to Marina on a different spoke. Once we get access to the Impact Area currently closed by the Army, there's a really nice short loop on the ridge behind Seaside, in 100% open space. Significant construction could start in early 2020. Here's some things that need to happen first. There's an RFP out now (March 2018) for consultants to complete the EIR. Approval of the selected consultant is scheduled for June 27, 2018. The EIR would commence shortly afterwards, and would take about a year. Once the EIR is certified, we move to prioritization of segments, final design, obtaining rights-of-way etc., concurrence with partner organizations, and pulling permits. One or two very small pieces might get constructed sooner, as part of projects by others. Yes. FORTAG is intended to promote active transportation i.e. walking and cycling using bikes, trikes, and wheelchairs. FORTAG will create safe, accessible, and enjoyable active transportation routes between important transportation nodes. These nodes include residential, employment, and commercial centers in the city centers of Seaside, Marina, Salinas, Monterey, and Del Rey Oaks; and also important nodes near the perimeters of the cities e.g. CSUMB, Ryan Ranch, East Garrison, the Presidio of Monterey Annex, the Department of Defense Data Center, and Marina Municipal Airport. Some of these nodes are among the largest employment centers in our region (Ryan Ranch, CSUMB, DOD Data Center). What events will be held on it? There a lot of potential for special events on FORTAG. Running events are an obvious option. The Northern Loop is a half marathon (13.1 miles); the CSUMB loop is just about a 10K (it's 5.5 miles); and the 'grand coastal loop' is just over a marathon (it's 26.4 miles). Cycling events are another option; not the super-fast ones, but the more casual ones. For example, the trail is an ideal potential component of the Sea Otter Classic's Gran Fondo, which in 2015 had a 51 mile route and a 91 mile route. Walking events for charities etc. would also be a great way to use the trail system. FORTAG has three main loops - around Marina, around CSUMB, and around Seaside & half of Del Rey Oaks. If you imagine these loops as wheels, then the "spokes" are the spokes of those wheels. They are intended to be Class 1 and Class 2 (with sidewalk) paved multi-use trails that extend from the urban core areas outward to meet up with the main FORTAG loops. (Class 1 means paved, but physically separate from cars; Class 2 is a striped lane on a road with cars next to you.) The spokes are how people connect from their local area out to the regional connectivity facilitated by the main FORTAG loops. These terms mean different things in different contexts. In the context of FORTAG, the "greenway" is simply a corridor of inter-connected "open-space", and "open-space" includes pretty much anything except busy roads and dense or extensive built-up areas (i.e. residential, commercial, industrial, etc.). - Anything we left out? Please let us know. Note that the above list is not a list of what is consistent with FORTAG, or by exclusion, what might be inconsistent with FORTAG. Rather, it is a list of what might "count" as greenway, when we're evaluating FORTAG's values relating the need to maintain 100% connected loops of open-space, even if the open space is at times narrow. Things that do not make the "cut" as "open-space" are encouraged by FORTAG adjacent to the greenway. The goal is that the greenway should be generally at least 300 feet wide. The paved trail should have generally 150 feet of open-space on each side, or it should meander back and forth within a 300-foot belt. Occasionally, the greenway will need to narrow down to as little as 38-feet, in places where development of the built environment has priority. An example of this is within the Dunes on Monterey Bay development, between the 8th St bridge over Highway 1 and 2nd Ave. During these narrow segements, it is important to maintain continuity of the visual experience of travelling along FORTAG. A good model for this is the Monterey Bay Sanctuary Scenic Trail as it moves through the Cannery Row area. The value "150 feet" derives from this being about how far you need to be away from traffic to avoid the traffic noise precluding a pleasant experience. The model for this concept is the difference between two paved trails that parallel HIghway 1 between Marina and Sand City. One is these trails is only 30 feet from the highway; it is not particularly pleasant; it is perhaps even briefly stressful. The newer one is typically 150 feet from the highway; it provides a markedly different experience - a relaxing, recreational experience that also sereves an active transportation function. The current estimate is about $40 million. This is estimate assumes $1 million per mile, plus $600K for each of three underpasses, and $2M for an overpass, rounded up to the nearest $5 million, with a little extra for good measure. So far, we have secured $21M in funding: $20M through a county-wide sales tax increment approved by voters in November 2016 (to be collected over many years), and $1M from state sources provided to transportation agencies. Some of the overall cost amounts to a refocussing of exising costs that are anticipated independently of FORTAG, such as the costs borne by developers for enabling bike & pedestrian access to regional transportation networks. What will be its economic impact? We anticipate that FORTAG will easily pay for itself many times over through effects like increased home values near regional trail systems, increased tourism attraction, increased health and overall quality of life, and the indirect effects stemming from an increased sense of connectedness among our communities. Yes. There are many examples of similar trail systems around the United States and the world in general, although we think we have one of the best starting points of any of them - because of the unique circumstances that arise from closure of an enormous military base right on the coast. When we get a chance, we'll list some of our favorite existing trail systems - ones that inspire and inform us as we move forward. Good Californian examples are the Napa Valley Vine Trail and the Coachella Valley CV Link. No. Well, partly. At the most coarse scale, it's hard to image substantial deviation from the major alignments we've selected. At intermediate scale, we're still occasionally re-drawing the lines as we better understand constraints and realize new opportunities. Keep in mind that we've had over 250 meetings with over 78 organizations in order to arive at the currently proposed route. At the finest scales, lot's of things will always need tweaking as planning proceeds. Informally, lot's of people. We've met with over 220 people in small FORTAG-led meetings, and given 20 well-attended public presentations. There's a widespread positive attitude about FORTAG; we might even say *overwhelmingly* positive. Any time a concern has been raised, we've been able to address it by making adjustments. Further details are listed on the timeline page. No. This is really important folks. FORTAG is an independent concept. We think FORTAG will be a great asset to our region regardless of whether any particular proposed development project happens or doesn't happen. You can support or oppose any development, without this affecting your ability to support FORTAG. We try to work with the proponents of proposed development projects to see ways for FORTAG to complement them, should they be approved. When necessary, we show "alternative" alignments on our maps to explore different options that might result from projects being approved or not. We're talking here about proposed projects like Eastside Parkway, and developments that may occur in Seaside East. Yes. Once a development is entitled, we become a little firmer about drawing the lines on our map in ways that tie-in very closely with development projects. But even then, there's a range of situations. For example, the Dunes on Monterey Bay is partly constructed and very active; FORTAG's alignment through the Dunes is intended to complement the Dunes project down to the nearest foot. Marina Station, on the other hand, is fully entitled but not active; FORTAG has "Phase 2" alignments that complement that project. Yes. At least that's the short answer. Formal consistency is something that the FORA Board will need to determine at some point. This determination will look closely at how FORTAG relates to Figures 3.6-1 and 3.6-3 of FORP. These figures and the accompanying text are an area of ambiguity in FORP, because 3.6-1 talks about "trail/open-space linkage", but 3.6-3 maps this as "hiker/biker trails" that look like they often run right next to roads, and not in open-space. To us, it's not really a "trail" if it primarily runs next to a road. FORTAG corrects this ambiguity by laying out a system of trails in open space that captures the essence of 3.6-1 and 3.6-3 with more detail, less ambiguity, and more spirit. We've spent a lot of time working with FORA staff and FORA stakeholder groups on trail planning within FORA's own context. The FORA Board recently approved a "Draft Trails Concept" that mirrors FORTAG very closely. Yes, and we've met favorably	with all private landowners involved (except for one in Phase 2 to whom we've reached out, but not yet met). An example would be Monterey Peninsula Properties, who own some development parcels in Del Rey Oaks. Another would would be representatives of Monterey Peninsula Engineering, who own some land near the Salinas River that would benefit FORTAG tremendously if a spur loop could be alignment through it. As a 30 mile system of trails embedded within greenways, FORTAG is intended to be a unifying concept encompassing many themes, including: military history, remembrance of veterans, accessibility, informal interpretation of natural history, agricultural history, native American history, early Californian history (e.g. De Anza Expedition), outdoor recreation, as well as formal education in fields such as the environment, planning, health, kinesiology, and tourism. Overall, FORTAG's environmental impact is intended to be net positive of course! The greenway component of FORTAG will include low-level protection of some habitat that might otherwise be developed, and in particular, will promote habitat connectivity that might otherwise have been disconnected if we failed to think regionally. We also strongly believe that FORTAG will promote greater environmental stewardship in general throughout our community, and that will lead to broad environmental benefit. But there will be small-scale negative effects that will require specific mitigations. For example, we'll be paving a trail through areas otherwise designated as habitat under the draft Habitat Conservation Plan (HCP) for the former Fort Ord. This will destroy some habitat, and bisect some habitat. To be allowed to do this, the draft HCP requires designation of additional habitat acreage as mitigation for FORTAG's impact. We're working on this. Yes. But we're still working on a sustainability statement. It will include things like the benefits of active transportation, as well as the selection of sustainable construction materials, and sustainably rated construction firms. How long will it take to build FORTAG? Will FORTAG built in stages? Yes. But don't ask us yet which bit gets to go first - maybe the bit through Dunes on Monterey Bay near 8th St, because they're already well into construction on that overall project. The Transportation Agency for Monterey County (TAMC) is acting as the lead agency so far. They'll receive the $20M for FORTAG from a sales tax increment. They've also allocated $1M of their state funds to FORTAG, and are actively submitting major additional grant poroposals. "We" right now is essentially a small group of volunteers. We're enjoying the agility and freedom of this phase, but we realize that we can't do it all, and that the agencies will to some of the really havy lifting, retaining "us" as strong guiding voice. Maybe we'll form a 501(c)(3) along the way. Does the main trail component of FORTAG have to be paved? Yes. A key goal is that a 6-year-old on a bike should be able to traverse all 30 miles safely in most weather. This requires a paved surface - hard, smooth, resilient, wide, grippy, and able to have stripes painted down the middle to prevent kids getting nailed by oncoming bikers. We also want as much as possible of the route to be accessible by wheelchairs, the elderly, and other folks with limited mobility; so far we're looking at 100% of the route being accessible. As an alternative to asphalt, we're looking at using more natural paving technologies in the most envrionmentally and aesthetically sensitive segments. One approach is to use decomposed granite and a natural binding agent to achieve pavement that looks natural but is smooth, hard, and resilient like asphalt. The result is also more permeable to water, which reduces the need for erosion control infrastructure. A paving machine is used to apply it, just like asphalt; but it can be done in a low-impact way for a 12-ft wide trail entirely within a 20-ft construction limit. Our understanding is that this approach can be more expensive than asphalt, for a given strength rating; so we'll probably still use asphalt in areas closer to the urban landscape. Lots. But we haven't listed them all yet. Good question, and we're still learning about this and exploring options. Initially, we're looking to the individual juridictions (four cities, the county, and CSUMB). TAMC also has an over-arching role. In the longer term, options include MPRPD, a new special district, or a joint-powers agreement. Yes. The paved trail component of FORTAG is intended to be as safe or safer than the Monterey Bay Sanctuary Scenic Trail (a.k.a. the Coastal Rec Trail). The gradients should be slight. The lines of sight should be wide open. The width should accomodate opposing directions of travel at reasonably high speeds. Yes. See our accessibility page. No, and yes. The main FORTAG alignment does not go through the Impact Area (this is the huge fenced-off area a little ways east of Gen. Jim Moore Boulevard where the Army is still clearing unexploded ordinance). Instead, the main FORTAG alignment skirts around the western edge of the Impact Area primarily in a 200-ft wide zone know as a Category 1 Borderland, between the Impact Area and some proposed development areas within Seaside, Del Rey Oaks, and Monterey. However, we have proposed a spur loop of FORTAG that does go through the Impact Area. This spur loop would access unique 360 views above Seaside encompassing the entire Monterey Bay, inland Fort Ord, Santa Lucia Range, and Santa Cruz Mountains. It would be a landmark asset to Seaside residents, who could head up the hill from Seaside and complete a pleasant 3- to 5-mile paved open-space loop after work or school. We've also suggested the alignment of some non-paved public access routes through the Impact Area so that people to the west and south of Fort Ord could enjoy the vast, peaceful rolling chaparral hills, and the view from the highest point in the former Fort Ord (940 ft, 1-mile west of Laguna Seca). None of this is certain. Eventually, it is anticipated that the BLM will take over the Impact Area, and it is possible that at that time the BLM will begin to allow access along parts of a network of existing fuelbreaks where the ordinance clearing has been most extensive. It is much less certain whether the BLM would entertain establishment of new trails. Any new trails would probably need to stay within the fuelbreaks. Mountain biking continues to grow as a huge sport, and Fort Ord already hosts the nation's largest bike festival and an incredible network of dirt trails. Local schools have mountain bike teams that compete on Fort Ord. But it's still probably a relatively small fraction of our local communities that use these trails regularly. We think this is partly because of poor connectivity and outreach. A key goal of FORTAG is to facilitate increased use of Fort Ord open spaces by its geographically closest communities, and a big part of this is enabling people to safely ride their mountain bike from home or work out to inter-connected networks of first paved, then non-paved trails. Mountain bikers will be able to use the greeway component of FORTAG as a corridor within which single track trails can be located and maintained, subject to any applicable habitat constraints. Mountain bikers will also be able to use FORTAG to access existing core areas for mountain biking, like the "Happy Trails" network near Intergarrison Road, and the National Monument. Currently, a lot of bikers drive to the trailheads at the Jerry Smith Corridor and 8th and Gigling. FORTAG will bring those trailheads within closer range of communities, making it easier to bike to the trailhead. This will also make it easier for people to discover mountain biking areas like Happy Trails by virtue of happening upon them while venturing along the main FORTAG trail that probably runs pretty close to their home or workplace. FORTAG is also intended to facilitate the establishment of new mountain biking opportunities, such as may be available along well-defined routes in the "Impact Area" at some point in the future. Equestrians will derive the same basic list of benefits as mountain bikers, but along separate "preferred" alignments in area areas where coalignment might cause conflict among uses and where there is room for multiple trails. The benefits include - riding along the greenway, better connectivity from nodes like the Marina Equestrian Center to non-paved trail systems like Happy Trails and the National Monument, and facilitation of new areas being opened for riding. We're trying to avoid the idea of designating trails as equestrian-only or bike-only or pedestrian-only. But we imagine that a system of designating "preferred" uses in certain places might facilitate more efficient and respectful use of the overall landcape. Hopefully this is obvious. We're talking about 30 miles of 12-ft-wide paved loops through open-space with no cars beside you and minimal road crossings. How good can it get? Ok, it gets better. One of the loops is very close to a half-marathon; and the grand outer loop is very close to a marathon. What better place to train for our world-famous marathon events, all of which occur on roads with cars where it's a little difficult to train i.e. the Big Sur Marathon, the Big Sur Half Marathon, and others like the Salinas Valley Half Marathon. Also, because FORTAG is intended to serve 6-year-olds on bikes, the terrain is either flat or rolling, but never steep. This is very compatible with most road running events. Basically the same as for mountain bikers and equestrians (see above). We want anyone in Del Rey Oaks, Seaside, and Marina to be able to reach a spoke along quiet streets within a few minutes of their house or workplace. Then, after a few minutes on the spoke, you've arrived at one of the main FORTAG loops. At that point, you leave the paved trail and jump onto a running trail within the greenway. You head along that for as long as you have, then re-enter the urban landscape via another spoke. It's a 30 minute loop from home after work with a decent dirt component, and some opportunity to explore a bit. On the weekends, you go big. Use the spokes and FORTAG to reach one of the major non-paved trail systems like Happy Trails, or the new opportunities opening up at Jacks Peak and Rancho Aguajito. FORTAG will benefit hikers by providing convenient access and connectivity through extensive natural and peaceful landscapes. Apart from the mutual benefits that birders will share with hikers, bikers, equestrians etc., there's a few key additional points for birders. One is that almost all of the greenway is envisioned to allow low-impact off-trail uses like birding, plein air painting, and wildlife track identification. These off-trail uses are prohibited in the National Monument, and are not yet assured within the Happy Trails area (although we are lobbying for them). Birding is much better when you can wander off trail a bit to get a better a look; so arguably, the birding on FORTAG could be better than the birding on the National Monument; what a concept! But perhaps the main benefits to birders are the specific areas we're seeking to open-up to public access in a controlled responsible way; areas that are currently either physically or legally inaccessible. 1. The Salinas River. Believe it or not, there is no public access to the Salinas River downstream of King City, other than underneath the bridges where public roads cross the river, and not counting the Salinas River Wildlife Refuge, which technically incorporates the Salinas River Lagoon, and not the river itself. A rapidly closing opportunity exists to create public access to the river near the Marina Airport. Most of the land is owned by the City of Marina, including both banks of the river in one stretch. Birders will not be surprised to read that this stretch contains magnificent riparian habiat with cathedral cottonwoods and willows. Warblers abound, along with grosbeaks, vireos, herons, buteos, kites. Various ducks profit from a large beaver impoundment in dry years; and from the Salinas River Diversion Facility in wet years. 2. The Marina Grasslands. Just up from the river is a long bluff protecting elevated grasslands owned by UC, the City of Marina, and a private landowner. FORTAG runs through it all (or possibly adjacent, in the case of the private landowner). The habitat has mostly grassy appearance from a distance, but up close it turns out to have plenty of mock heather, lupine, sagebrush, bracken fern, and locally coyote brush and then coast live oak. A harrier is never far, as are red-tails, accpiters, & the occasional kite. Meadowlarks dominate, with redwings and Brewer's closer to grazed areas. More intimately, savannah sparrows are revealed, and perhaps horned lark. 3. Sandmat Hill. This is a little known chaparral location with a great view in the general area of the old landfill, not far from the site of the formerly proposed "Whispering Oaks" project. We named it for the sandmat manzanita that characterizes the hill itself, and the locality in general. It will remain completely forgotten unless we continue to work on plans to keep our communities connected to the hidden open spaces right next door. The habitat here is precious and to be respected - including sand gilia and Monterey spineflower. It's classic wrentit habitat - a dime an acre in the Monument, but not so easily found close to residential areas. 4. Happy Trails. This is the vast undulating oak woodland near Intergarrison Road that mostly lies outside the National Monument. FORTAG facilitates access to this area. It's not far from the home patch of one of the FORTAG proponents, where 103 species have been checked on a single 1.4 mile loop. The local favorites include oak titmouse, Hutton's vireo, Nuttall's woodpecker, Towsend's warbler, and Lawrence's goldfinch. In 2014-5, we had a great winter for varied thrush & band-tailed pigeon. 5. The Impact Area. We're not assured of entry, but we almost certainly will be able to walk the ~5-mile length of the western and southern borderland fence, protected from major roads and development by a 200-ft fire protection buffer. The habitat is a vast ocean of maritime chaprral, heavily reduced to an early successional state by ordinance removal, yielding interesting open country birds like horned lark, greater roadrunner, and American pipit. 6. The Frog Pond Expansion Area. The existing Frog Pond Regional Park is a great little riparian spot in Del Rey Oaks, wedged into Canyon Del Rey between Monterey Airport and Seaside. The Regional Park District now also owns a similar-sized area just east of Gen. Jim Moore Boulevard, and plans are afoot to connect the two via an underpass inculding FORTAG, and the people and wildlife that enatils. The area has some herbaceous wetland, a willow floodplain, some moist coast live oak, and steep uplands with some maritime chaparral species that are not always well represented elsewhere on the former Fort Ord. This location is the intersection between the chaparral/oak habitats of much of Fort Ord, and the more coniferous habitats of Jacks Peak and the Santa Lucias (and even some introduced redwoods). So, for example, you could easily check five woodpecker/flicker species in one outing, or a brown creeper. FORTAG will provide many miles of wheelchair-accessible paved trail through open-space, served by multiple accessible trailheads. The main component of this that we are looking at initially is the gradient of the trail. We're plotting maps of trail gradient, comparing those to the accessible trail design standards for California State Parks, adjusting the alignment to keep the gradient within standard, and seeing how many continuous miles of accessible trail we can achieve. As we move toward more detailed planning, we'll also need to look more at ramps, rest stations, amenities etc. We have a page where we're recording more ideas on FORTAG's accessibility. FORTAG will provide 30 miles of kid-friendly paved-trail separated from cars and immersed in open-space. Our main design criterion for the whole trail system is that it must be safe and enjoyable for 6-year-olds on bikes, and their parents. Of course, that means that a lot of it will be good for younger kids with training wheels, kids on trailer-bikes, and strollers. We're also thinking about spokes, ways of safely getting to the main trail from residential areas - perhaps not quite as peaceful as the main trail, but still safe from fast cars. The kid-friendly status of the trail will be achieved by having a wide, paved trail, away from cars, maintaining a shallow gradient throughout, and having only infrequent road crossings. On that last point, we're trying to minimize places where you might need to get your kid off their bike. The trail system includes three underpasses and one bike/pedestrian bridge that helps accomplish this. The most difficult crossing would be at the traffic signal crossing Fremont Boulevard at Canyon Del Rey Boulevard; that one also invloves a stretch where you'd probably want your child to walk their bike along the sidewalk to get past the busy parking area for the supermarket. Another major one is the traffic signal at Del Monte Avenue and English Street in Monterey; but even there, we're now considering a major budget item to redesign that street to include a Class 1 bikeway. At other crossings, we envision crosswalks e.g. at South Bundary Road, Eucalyptus Road, and Intergarrison Road. FORTAG is one of Seaside's best opportunities to get strong recreational benefit from the closure of Fort Ord. The core benefit is being able to walk or bike along a safe, pleasant, scenic loop trail just a quarter-mile from Broadway and Jim Moore. After work or school, you could head up from the International School of Monterey (ISM) at San Pablo, along FORTAG, back down at Hilby, and along Yosemite for a 3-mile loop from ISM that is about half in open space. If you have more time or energy, and BLM's plans roll our way, you can do 5-miles taking in some of the Impact Area, with most of the loop now being in an open-space sanctuary with your senses surrounded by the Fort Ord wilderness, Monterey Bay, and distant mountain ranges at three of the four points of the compass. FORTAG will facilitate active transportation between central Seaside, Ryan Ranch, the DOD Center at Gigling, planned development at Seaside East, and CSUMB. FORTAG adds substantial value to the planned Projects at Main Gate (just north of Lightfighter, west of CSUMB). It increase the tourism value of the planned hotel by placing a regional bike trail right outside the front door. It draws customers to planned casual dining in the Main Gate shopping center. FORTAG increases connectivity to Laguna Grande Regional Park. It re-purposes the ruderal dead-end at the east end of the park, and it creates safer connections to Monterey and the Sanctuary Scenic Trail in the area of English Avenue. One of our favorite benefits to Marina is for the folks on the northern side, near Windy Hill. You live right next to a wonderful open space of grassland that culminates in a 3-mile long 100-ft tall bluff overlooking one of the most scenic and celebrated valleys of our place and time. But you can't reach it by foot or by bike! There are fences, and they don't really need to be there. 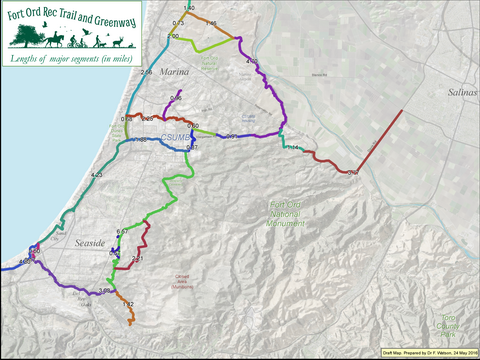 FORTAG proposes to create trail connectivity from Windy Hill out to the Marina grasslands, the Salinas RIver bluffs, and the river itself. This puts a bike ride with your kid from Crescent Ave to dipping your toes in the Salinas River at 2.5 miles range. That's only 15 minutes; and the whole journey is pleasant; no cars. And then there's the main Northern Loop of FORTAG. Thirteen miles is a very bikeable distance for almost anyone on the weekend; almost entirely in open space; all safe; no cars. And has been said elsewhere on this page, the spokes leading to the Northern Loop can be used to create smaller "after-work" or "after-school" loops at about 5 miles apiece. Do you ever get the feeling that it's great to live in DRO, and that although Del Rey Park is a lovely spot for a volleyball game and a short dog walk, it's really hard to safely get out of Del Rey Oaks on foot or on a bike? We have that same feeling, and we think we can solve most of the problem. There's enough public space and willingness of mind to create a single trail that connects from the Bay all the way out to Fort Ord, linking together a string of pearls: Monterey Bay Sanctuary Scenic Trail, Roberts Lake, Laguna Grande, Work Memorial Park, Del Rey Park, Frog Pond Regional Park, a corridor through the DRO development area in the former Fort Ord, and the Fort Ord National Monument. It's pretty straightforward to envsion all the segments being safely connectable, leaving just one spot where you have to be mindful of the automobile, at Fremont Boulevard. Take a look at our maps of Canyon Del Rey area for the details. Once DRO has this route, DRO residents will benefit by being able to bike or hike out to Fort Ord without fearing for your life at the south end of Gen. Jim Moore Boulevard, and by being able to bike down to the Bay without that sketchy section where the bike lane dissappears from Canyon Del Rey Boulevard on the northern side of Fremont Boulevard, and without wondering if anyone really intended for travel along the Class 2 bike lane past DRO City Hall to be anything but life-shortening. There are also indirect benefit opportunities. DRO lies geographically between the former Fort Ord and everyting that Monterey proper has to offer. Once bike & pedestrian connectivity is established between these areas, DRO could capitalize on it with some retail initiatives, like a trailside cafe overlooking a restored wetland near the new Garden Center in Work Memorial Park, or in the new DRO development area on the former Fort Ord. If you are a biker or pedestrian in Monterey, you've probably used the Monterey Bay Sanctuary Scenic Trail often. But has it ever bothered you that it's not a loop? What if you could bike up the coastal trail to, say, CSUMB, and then instead of turning around and biking right back, you could head inland through CSUMB, up into the Fort Ord open spaces, and then follow these open-spaces south along scenic ridges behind Seaside down to Canyon Del Rey, where there'd be a new safe route bringing you home to Monterey without ever having to endure hardship with cars except for one signalled crossing at Fremont Boulevard? That would be extremely cool right? That's the main Southern Loop of FORTAG. Ditto. Hey, there's only 334 of you. But you live right next to the coastal rec trail. You live so close that you might even be tired of out-and-backs along that wonderful trail - "Do I go south today, or north? Those are my only two choices." Instead, imagine a future where on the weekend, you can grab your bike, zip over to Tioga Ave or Roberts Lake, and check off a 16-mile open-space lap of Seaside before lunch i.e. the main Southern Loop of FORTAG. FORTAG intends to provide major boost to recretional trail opportunities close to Salinas. Creekside trailhead is awesome, but it's a little on the steep side for some folks. Our intent is to supplement that with a trailhead near Blanco Rd, so that Salinas residents could drive down Blanco to the trailhead, then jump on the trail and immediately be cruising along the flat terrain of the Salinas River bluffs in either direction, enjoying peace and quiet and fabulous views. Those more energetic could try the bluff loop: down 100-ft vertical to the floodplain, along the floodplain for about 0.7 miles, then up and along the bluffs to complete a 2-mile loop - more if you also take in the view from Radar Hill. For commuters, the new alignment of the Multimodal Corridor facilitates safe bike connectivity between Salinas and East Garrison via Davis Rd and Reservation Rd, along an 8-foot cyclepath that will be physically separated from vehicles. Within East Garrison, current plans are just for Class 2 connections along fairly quiet streets; but we think there's potential to upgrade these to Class 1 given recent changes in County long-range land use planning. From East Garrison, FORTAG takes you in to CSUMB along a Class 0 paved trail (no cars, pleasant riding) instead of the Class 2 that currently exists along Intergarrison Road, and only in parts. Maybe you already drive to trailheads like 8th & Gigling or Badger Hills, or you've just been wondering about visiting Fort Ord somehow? How about biking from home, or if you did drive, getting off Highway 1 at the Del Monte Exit and starting your bike route in north Monterey. Park near the new In-n-Out Burger, bike the Seaside Loop, and grab some fries at the end, or maybe a coffee in a new trailside cafe at Work Memorial Park in Del Rey Oaks. Use the existing Sanctuary Scenic Trail to get down Marina, then use FORTAG to bike to CSUMB (for example), or take the 13-mile loop on the weekend and head back to Castroville. You're already heading down here for the big holidays and flagship events like the AT&T Pro-Am, or the Sea Otter Classic. Maybe you've done the Aquarium a few times now and are looking for something extra. Or maybe you were stationed here way back, and you haven't really had a chance to show your family what the base was like up close. FORTAG creates another world-class reason to bring your tourist dollars and transient occupancy taxes to our beautiful region. For a non-resident, either one of the main loops represents a memorable experience for the family on par with any of our existing nationally recognized attractions, but one that is also different, and capitalizing on the widespread and multi-faceted fascination for what Fort Ord was and what it is becoming. Sure. We're very interested to hear ideas, opinions, and criticisms. In fact, you could almost say we seek out criticisms, because we're really motivated to try and create a concept that has unanimous support, or at least as uninanimous as is reasonably possible. Just email us. I'm in a photo on the FORTAG web site; can I get a high-resolution copy of the photo? Yes. Just email us and we'll send it to you. I'm in a photo on the FORTAG web site; can you remove the photo from the web site? Yes, or at least very likely so. We certainly don't want to make anyone uncomfortable by taking their photo and then using it to promote FORTAG in public. If you are easily recognizable in the photo and you don't want it on the site, just let us know, and we'll remove it. If you're hardly recognizable, maybe the request is not justified. By the way, when we take these photos, we try to take a moment to explain why we're taking them and we share our business card. But sometimes we don't want to disturb folks, or things are moving too fast, and a quick conversartion might not be possible. No. Two of the major proponents happen to be tenured CSUMB professors, and for them, the process of planning FORTAG represents the expected commitment among CSUMB faculty to serve the communities that surround CSUMB. But FORTAG also represents faculty members' right to freedom of speech. The administration of CSUMB has been very supportive of the FORTAG effort. CSUMB has formally provided substantive support at some key junctures, and included FORTAG in its draft master plan update, and this role is expected to grow. But the ideas and opinions expressed by the FORTAG proponents (for example, in this web site) do not necessarily reflect nor constitute CSUMB policy. Yes, for now, and perhaps forever. The name FORTAG has a lot of hard-earned momentum in the planning process. We're not ruling out a different name as we get closer to a major implementation phase. The name FORTAG describes concept exactly; it is a very accurate name. Sure, it's not a very lyrical name; but it's pretty hard to come up with an accurate name that sounds better to the ear. The 'R' stands for "Rec" or "Recreational". But recently the word "Regional" has also been used. Both are good words. We're pondering this. It's hard for a small number of people to cover all the meetings that are happening. Having more 'boots on the ground' at those meetings would be beneficial. Remain sufficiently informed so as to be able to quickly research how specific agenda items might be relevant to FORTAG and might need some advocacy as a result. Always try to be positive! Trail construction standards for multiple uses (e.g. road bikes, horses) given different terrain, soils, environmental sensitivity etc. Any more questions? Just ask us!